Panic attacks can strike at any time of day and in any location. 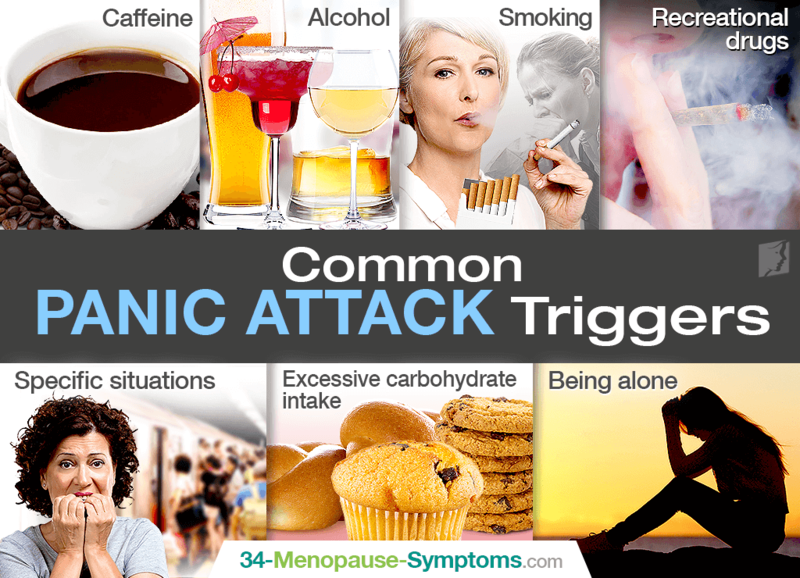 While causes of panic attacks are not completely understood, hormonal fluctuations are believed to play a role as women transition through menopause and into their unfertile years, and various triggers can set them off without prior warning. Continue reading to learn more about common panic attack triggers as well as what you can do to resolve these life-disrupting disturbances. Caffeine. One research study found that caffeine consumption, in general, leads to anxiety, especially in those predisposed to having panic disorder. Interestingly, another discovered that doses higher than 300 mg at a time did increase anxiety, regardless of genetic predisposition. Alcohol. While alcohol is often used as a sedative for those dealing with anxiety issues, it can actually increase anxiety within just a few hours of its consumption, thus triggering panic attacks. This includes even moderate consumption. In addition, alcohol withdrawal is also a trigger for panic attacks as it can cause symptoms of anxiety, heart palpitations, trembling, and more. Smoking. Various research studies have proven the link between cigarette smoking and increased anxiety symptoms or disorders, such as panic disorder and panic attacks. Evidence suggests that those who suffer from increased anxiety are more likely to smoke in efforts to relax, when in essence, this habit only worsens anxiety and panic attacks. Recreational drugs. While less common, research suggests that use of marijuana may make latent or existing mental disorders worse, including panic disorder, and trigger spontaneous panic attacks in those with a predisposition. Use of cocaine, ecstasy, and amphetamines can also lead to severe anxiety. Specific situations. Those who suffer from types of social anxiety may suffer from panic attacks when encouraged to attend public events or partake in any sort of gathering around others. What triggers panic attacks may also be crossing a bridge or being in small spaces, called claustrophobia. Excessive carbohydrate intake. Recent studies have found that there is a connection between a high glycemic index (GI) diet and the development or progression of mental health disorders, such as panic disorder. Likewise, there is a positive link between a diet high in sweets and refined grains and the risk for depression. A low-GI diet rich in fruits, vegetables, and fiber was associated with a lower risk of depression. Being alone. Panic attacks may be triggered by the feeling of loneliness or having to go somewhere without the company of someone who makes you feel secure. Those suffering from severe panic disorder may feel safer at home. For menopausal women, treating panic disorder and panic attacks starts with curing the underlying condition that is evoking them, hormonal imbalance. Lifestyle changes shown beneficial in reducing the occurrence of panic attacks include participating in regular exercise of 30 minutes a day five days a week to calm the mind; practicing relaxation techniques of yoga, deep breathing, and progressive muscle relaxation; and avoiding aforementioned unhealthy triggers of alcohol, caffeine, and smoking. Also, consider partaking in psychotherapy to help you better understand panic attacks and how to cope with them. For increased efficacy, incorporate alternative medicines of phytoestrogenic supplements - black cohosh, red clover, dong quai, etc. - to increase estrogen levels or hormone-regulating supplements, like Macafem, which nourish the endocrine glands to produce their own hormones. Medications used to reduce symptoms of panic attacks include antidepressants selective serotonin reuptake inhibitors (SSRIs) and serotonin and norepinephrine reuptake inhibitors (SNRIs) as well as the benzodiazephines, which are sedatives. Panic attacks often occur without prior warning and for a variety of reasons. Some of the most common panic attacks triggers include the consumption of caffeine and alcohol; smoking; specific situations involving crowds; excessive carbohydrate intake; and more. Since this is a psychological disorder, what triggers panic attacks in one woman might not trigger them in another. Nevertheless, various treatment options are available to decrease their occurrence, especially in menopausal women. Lifestyle changes involving the addition of regular exercise, relaxation techniques, and healthy habits into your normal routine can work wonders. Also, incorporate the use of phytoestrogenic or hormone-regulating supplements for optimized results. Panic attacks can appear for the first time during menopause, or become worse because of hormonal imbalance. Learn how to help your partner through them.